runs right through the village of St. Peters . 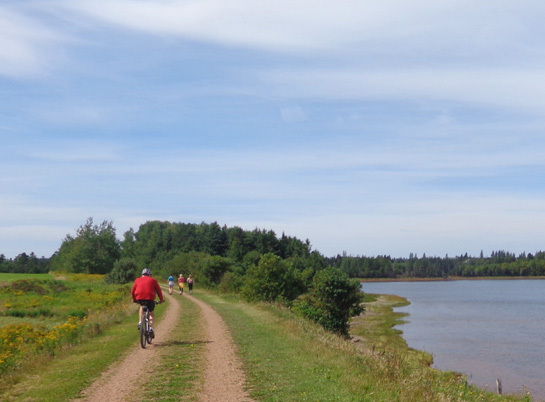 . ."
Just reading about the popular section of this trail between Morell and St. Peters was enough to put it on our list of Things to Do on PEI for the same reason we wanted to ride Gulf Shore Way at PEI National Park: it is about the only section of the Confederation Trail that runs next to water for several miles. 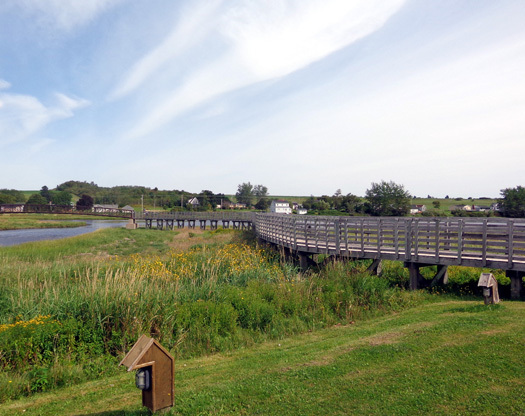 Today's weather was perfect for a bike ride -- partly to mostly sunny, 60s to low 70s F., some breeze. 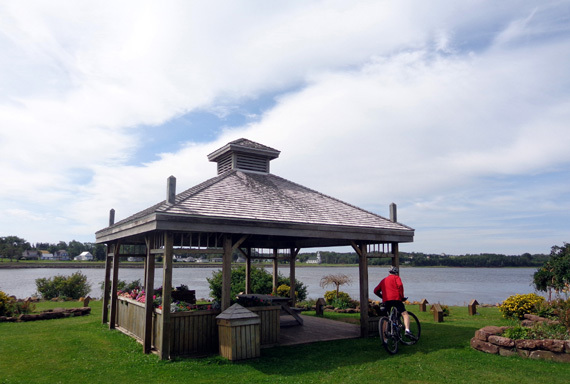 We rode our bikes east on the Confederation Rail Trail, part of the Trans-Canada Trail, to St. Peters and back. Our campground is marked with a green dot. 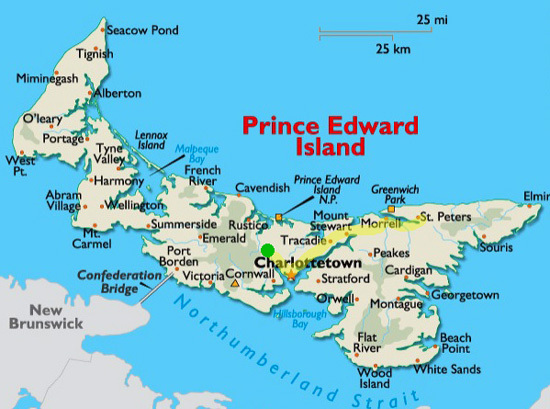 Hopefully your screen is large enough to show the towns of Morell (which is spelled on most maps and in our PEI brochure with just one "L," not two as on this map) and St. Peters to the upper right. 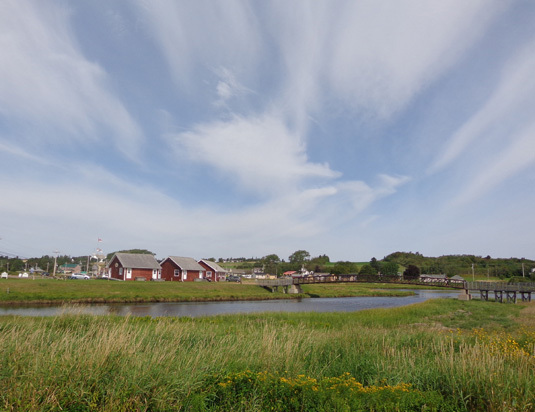 St. Peters is as far east as we traveled on the island while we were here. 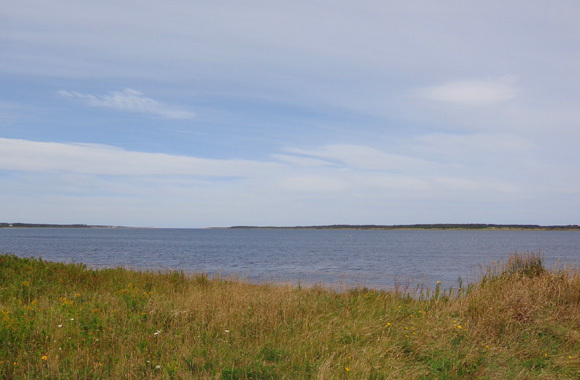 Most of this 12 km (7� -mile) section of trail between Morell and St. Peters follows the south shore of St. Peters Bay. 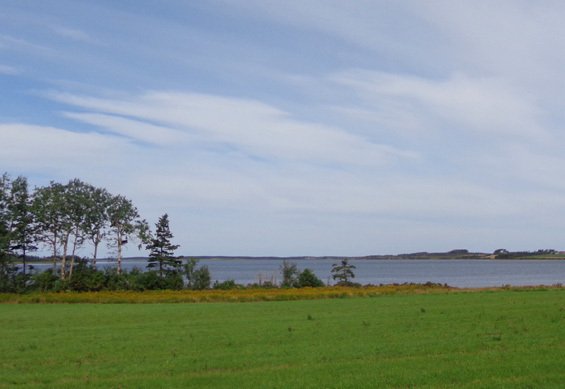 It's not a wide bay -- only � to 1� miles wide, so we could see land on the other side unless trees blocked our view. 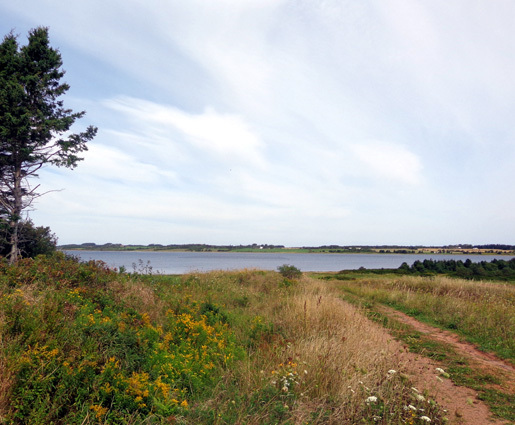 The trail is close enough to see St. Peters Bay for over six miles. 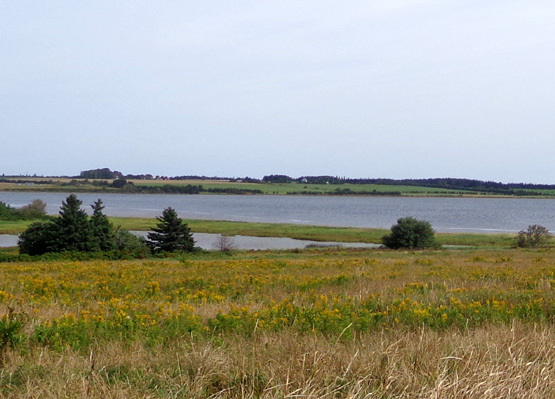 The bay itself is a little longer than that; we didn't see where the water flows in from the Gulf of St. Lawrence. North shore of bay is close here. 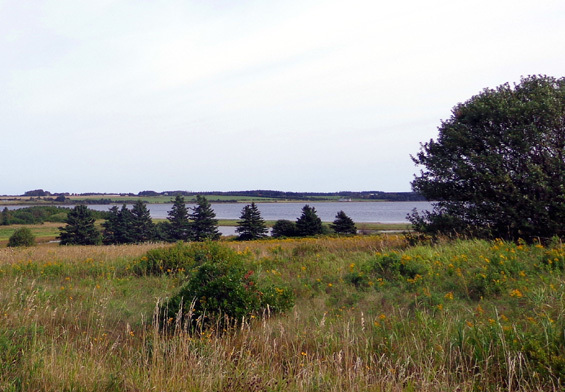 North shore of bay is farther away here but still visible from the trail. 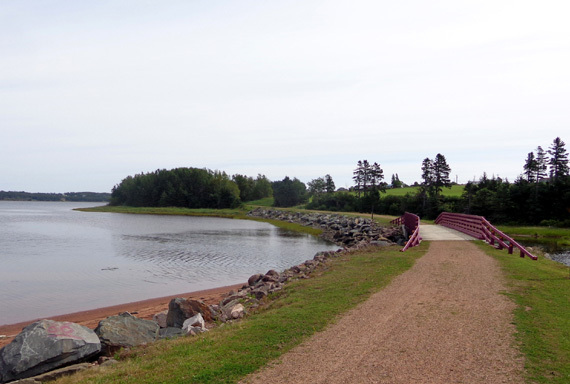 This is the most scenic -- and popular -- segment of the 274-kilometer Confederation Trail on the island. 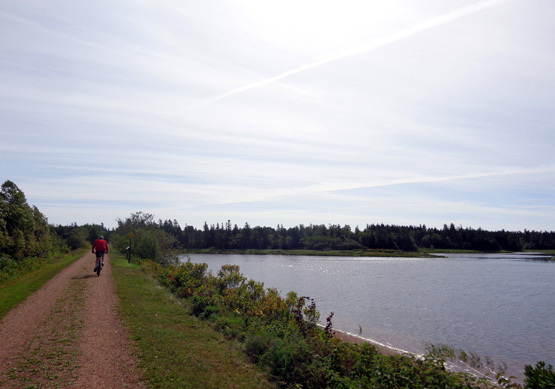 Another 170 km of branch trails extend to other parts of the island. That's a total of about 440 km or 273 miles of crushed stone trails in this system. 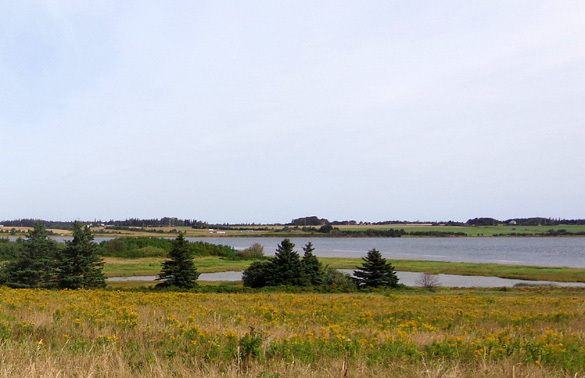 It doesn't include other trail networks on the island, such as those in PEI National Park. Although we saw a few other folks cycling and walking, I was expecting more people on such a nice Saturday morning. The trail surface in this segment is smooth double-track crushed rock, sometimes with grass in the center. Since it's a rail trail it's pretty flat. 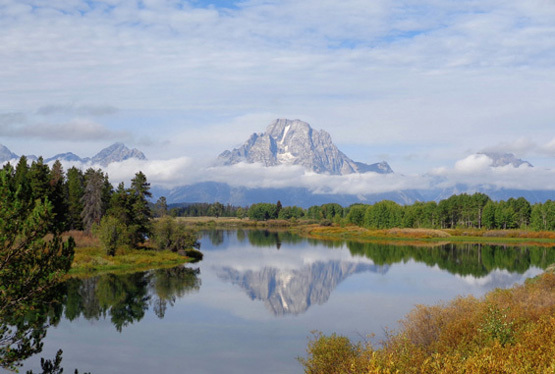 We were grateful that it curved around the shore as much as it did instead of being mostly a straight line. 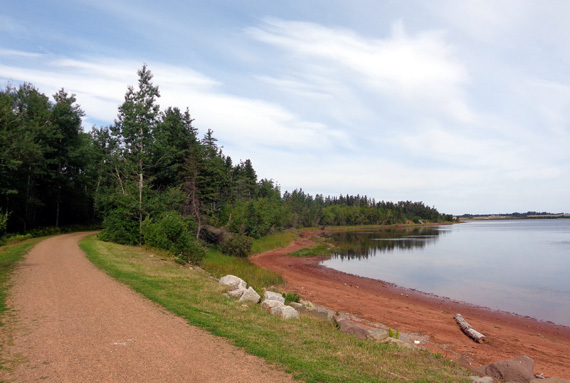 The sand on the south side of the island is reported to be even more red than that. 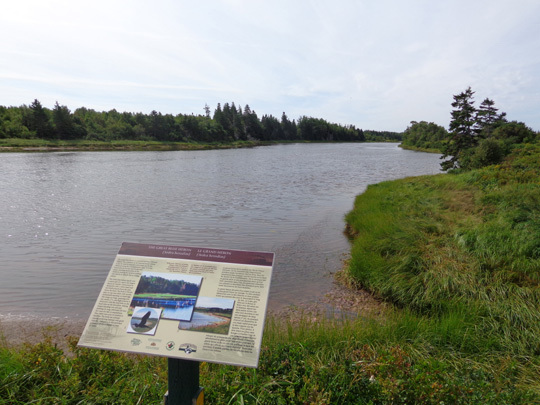 Interpretive panels indicate that they hold nets used to grow cultured mussels started from "seeds." 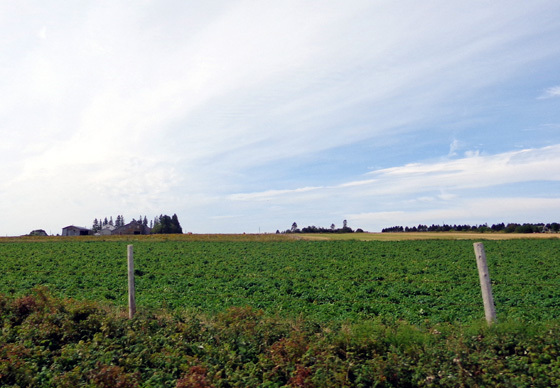 Each mussel farmer has a different color of buoys so he knows where his aqua farm is located. 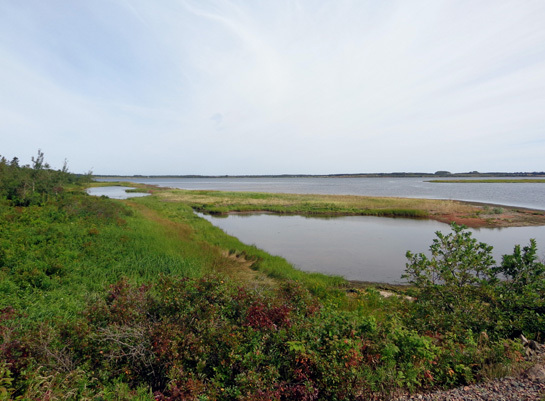 Cultured mussels grown in estuaries are a major part of the fishing industry on the island. 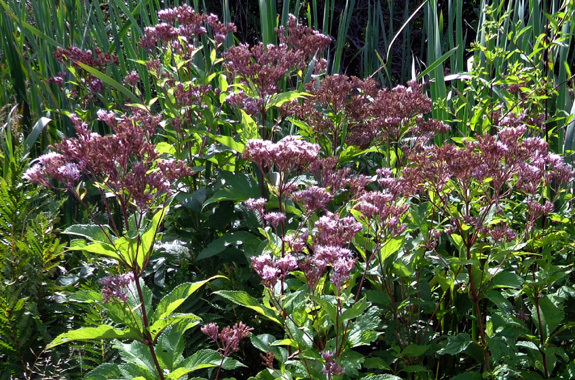 When mussel larvae seeded here become larger they are transferred to other rivers to mature. 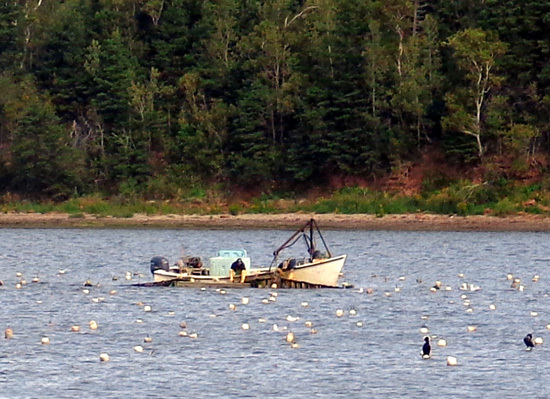 It takes about two years for the mussels to grow large enough to be harvested. 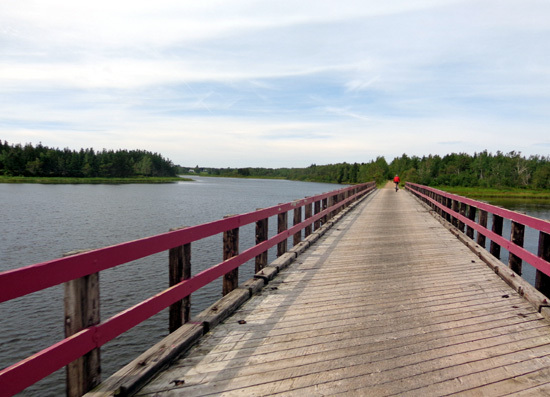 After eating our snack we rode our bikes back to Morell, for a total of 15+ cycling miles. 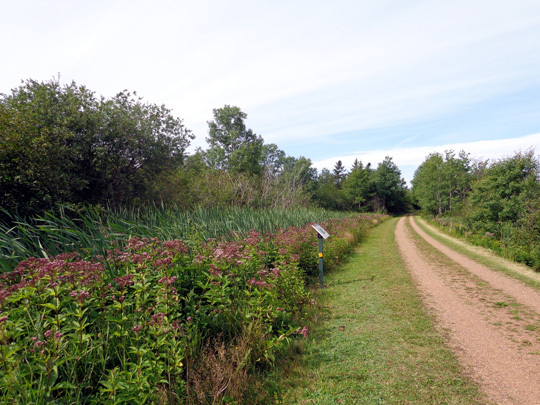 We liked this section of trail, especially when we had water views. 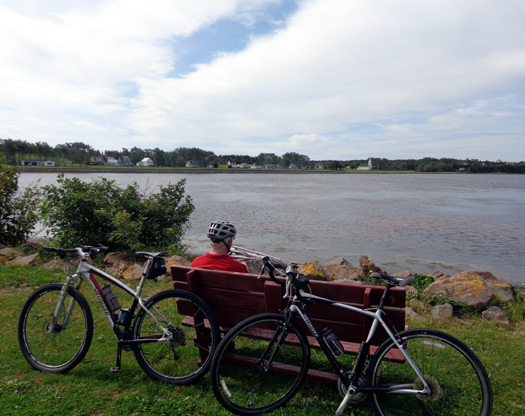 Before we got here I offered to crew Jim so he could ride the whole trail from one side of the island to the other, or just several long segments, but he declined -- partly because of the time it would take, and partly because the rest of the trail is inland and likely not this scenic. 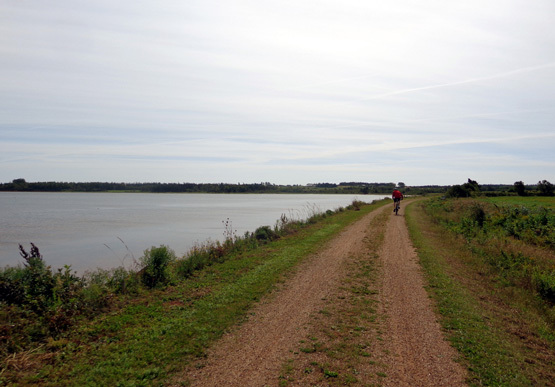 When we first got to the island we picked up two excellent guide books and maps of the Confederation Trail at the visitor center at the end of the Confederation Bridge. Both were free. 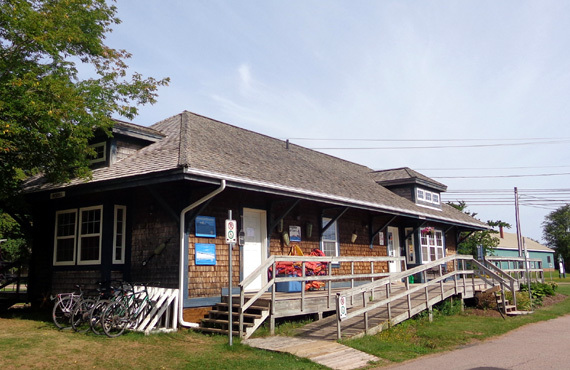 The welcome center where the ferry docks at Wood Island probably has the same information.